Let’s do a simple exercise of foresight using this geopolitical analysis model and the following scenario: It is taken for granted that the GDP expected growth by the UK Ministry of Defence is correct. As a consequence the map shows the distribution of relative economic power as it is in 2045. 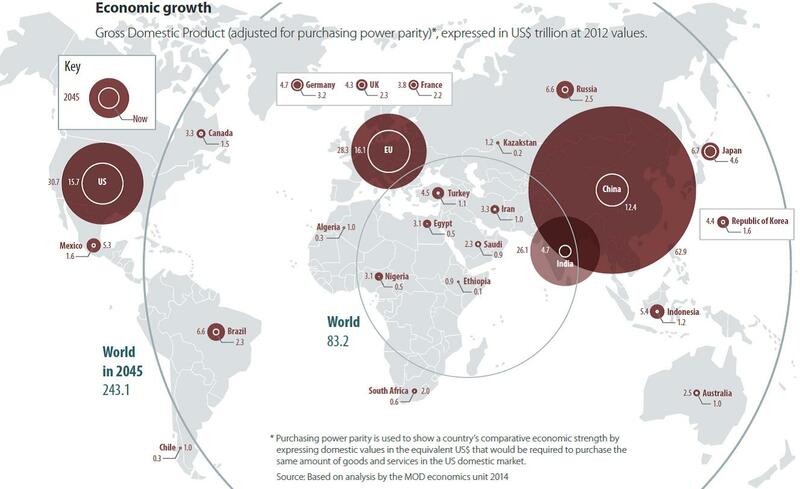 In this scenario, China has become the biggest economic power in the World by far. Its political ambitions have increased in parallel. Pekin has strengthened substantially its armed forces in order to support a more assertive foreign policy and to secure its vital line of communications. The great investments in defense, united to its advance technological development, have converted China the second arms exporter at World level, at a scarce distance of the United States and ahead of Russian defense industry, which China surpassed in the 2030 decade. This is the international landscape. Now the geopolitical analysis model is presented. 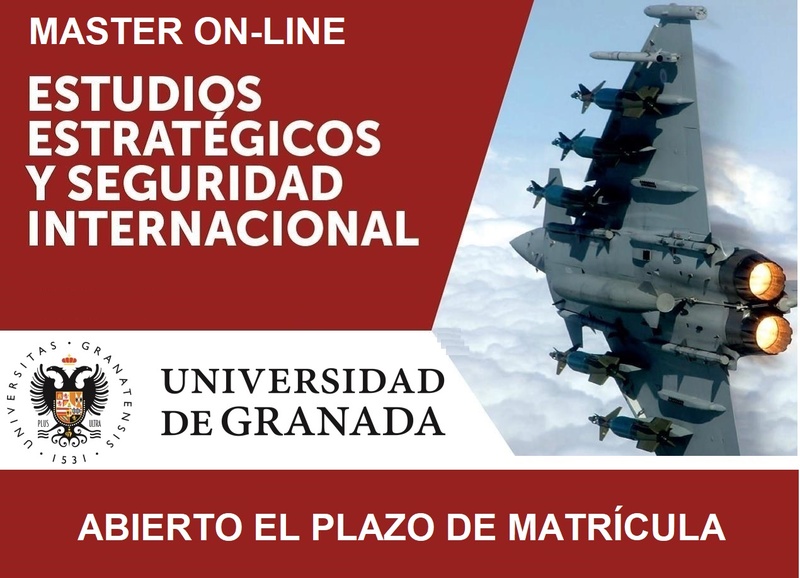 The model is built on structural realism and it is composed by four geopolitical imperatives: 1) reach and maintain and adequate level of relative power; keep territorial integrity; protect the frontiers; and guarantee the external connections. Having these principles in mind it is possible to glimpse which will be the systemic inputs –or by way of a metaphor in what direction the winds and streams of the international system will push. This knowledge will not be enough to anticipate with precision states’ behavior. Other factors will influence, as decision-makers’ biography and psychology; burocratic interest, political consensus, etc. In sum, numerous variables at the individual and state level (Kenneth Waltz first and second image) whose complex interactions convert foreign policy foresight in something similar to long term weather forecast. Nevertheless, it is useful to identify these systemic drivers. In one way or another they affect to the main foreign policy lines of the states. In the case a great power emerges in a regional system, the structural variables will push the other states to balance it. There are exceptions –v. gr. United Kingdom and France against an emerging Nazi Germany after the remilitarization of Rhineland or during the Sudetes crisis. But on the other hand dozens of historical cases exist where former antagonists coalesce in order to balance a regional hegemon aspirant: Catholic France of Cardinal Richelieu supporting protestant enemies of Spain and the Augsburg Empire during the Thirty Years War; years later the Spanish Monarchy and the Dutch Republic against Louis XIV France; United Kingdom and Spain against Napoleon; Republican France and Czarist Russia against Imperial Germany in 1892; United States and Communist China against the USSR in the 1970s; and currently United States and Vietnam against China. In all these cases the decision-makers payed attention to the systemic impulses in favor of balancing. Returning to the scenario: What would be the alliance structure if China became the main great power in 2045? In what direction will push the systemic streams? China will attract some minor powers to his side through economic incentives; for example, Cambodia, Malaysia and Thailand. In Central Asia Pakistan still will be an important ally of China against India. At the same time Iran and even Turkey will be key partners of China in the Middle East and Central Asia in the framework of Belt and Road Initiative. Other countries of the Indo-Pacific region –including Australia– will form balancing coalition against China. United States will join them as ‘offshore balancer’. Washington is presently concerned with the rising of China and its transformation in a global competitor. This apprehension will increase in the measure that China augments its relative power. As a response to Washington offshore balancing is plausible that China may convert its economic presence in Latin America in a tool for political influence against United States’ interest in that region. Russia. At the moment China and Russia are good partners competing with the United States. But in the next decades it is likely that the relationship may became colder in the measure that China’s relative power keep growing and Russia’s fear may increase in parallel. The Belt and Road Initiative pass through Russia’s sphere of influence in Central Asia and at the same time Russia and China share a frontier of thousands of kilometers (with Mongolia as a buffer state in great part of the frontier with Siberia). The unbalance of power in favor of China and the intense push of the third geopolitical imperative (defend the frontiers) make plausible the scenario of Russia may join the balancing coalition against China. In that case Moscow would be in the same trench that the United States. I know that this scenario looks counter-intuitive but let’s remind the historical examples mentioned previously. Europe. The map shows the drastic decrease of European countries’ relative power at the global level unless great advances in EU foreign and defense policy integration may be achieved. The map also puts in evidence the provincialism of exclusivist nationalist proclaims across Europe. On the other hand, my opinion is that Europe will avoid to take side in the balancing coalitions against China. Geography benefits good relationships between Europe and China. They do not share frontiers and the connections associated with Belt and Road are not a threat but adequate from the point of view for the fourth imperative. If a commercial balance between Europe and China is achieved –as president Macron demanded in his visit to China beginning this year- the partnership is call to prosper as much as it bother to Washington. This divergence between United Stated and Europe, plus greater American attention to the Pacific and the rapprochement Moscow-Washington against China, will entail a lesser commitment of the United States with the security of European countries. This strategic retreat of the United States from Europe will include the European eastern countries, unless the US support to them may became an asset to block the advances in EU foreign and defense policy integration: a role usually has been played by the UK. Europe will have to navigate numerous political, economic and demographic challenges in the decades ahead. The common foreign and defense policy integration will be one of them. If the scenario used in this exercise is materialized and if the center of world economy and politics is displaced to Asia-Pacific then the success of the EU integration process will be a condition sine qua non in order to assure Europe’s security and relevance in the world stage. Lastly, two brief reminders: 1) this exercise is based on a single scenario in which China continues its economic growth and became the major great power in the World, a circumstance that cannot be taken for granted and that is object of an intense debated. 2) The theoretical model used focus its attention exclusively on structural variables; mainly in the distribution of relative power. How individual level variables (political elites) and state level variables (internal politics) will determine the national responses to the systemic inputs it is extremely difficult to forecast. In any case the theoretical model let us build a plausible scenario on the great power’s alliance politics almost three decades ahead.